In the aftermath of the recent State Mine Fire in the Blue Mountains, my team at UOW revisited interview participants who were initially interviewed mid-2013 on their preparedness for bushfire. The State Mine Fire provided a unique opportunity to investigate if their preparations withstood the attack. During one interview, a participant vented his frustration with police orders to evacuate his property, as he was well-prepared to face the fire. He candidly asked me if legally he had to follow such an order when the ‘Prepare. Act. Survive.‘ policy guides people on how to prepare their property in order to stay and defend it. I promised to get back to him with an answer, as I needed to get my facts straight first. I sought the advice of a barrister and academic colleague at the ANU College of Law, Dr Michael Eburn who specialises in emergency law. Let the sea reclaim the pools? I’ve just returned from the beach. Made my usual, favourite stop at the ocean pool. One of Wollongong’s series of bathing pools cut into the rock platform in the mid- to late-19th Century. Today saw a mix of people there: a bearded guy doing laps; the elderly woman with bright swimming cap I see regularly (I’m sure she swims every day); and a bunch of early 20-somethings looking happy and relaxed. Climbing the stairs back up to the path, I spotted the flyer – neatly attached with cable-ties to the metal railing – that motivated this post. A newspaper clipping and hand-printed note announcing ‘Save Our Rock Pool’. You see, Wollongong City Council is proposing that it cease to maintain and/or demolish two or three of the city’s ocean pools as a cost-saving measure. Community action to ‘Save Our Rock Pool’. I have been fortunate enough on the last two weekends to visit two world heritage areas, the Bronze Age rock art of the Tanum area in Bohuslän, and the mediaeval town of Visby, on the Baltic island of Gotland. The Gotland visit was part of a field trip with old colleagues from the Landscape Science program at Kristianstad University, where I worked in 2005-06. A nine day field trip underpins the second year subject Svenska Landskap. It is described as a smörgåsbord of landscapes – a quick taste of many different things. Intensive or block teaching is standard in many Swedish universities, with students concentrating on one subject completely for five weeks. What does ‘flood country’ mean? This post is the fifth in our new series on drought, flood and water. The series makes connections between AUSCCER researchers working on watery themes, and showcases our new books and articles. 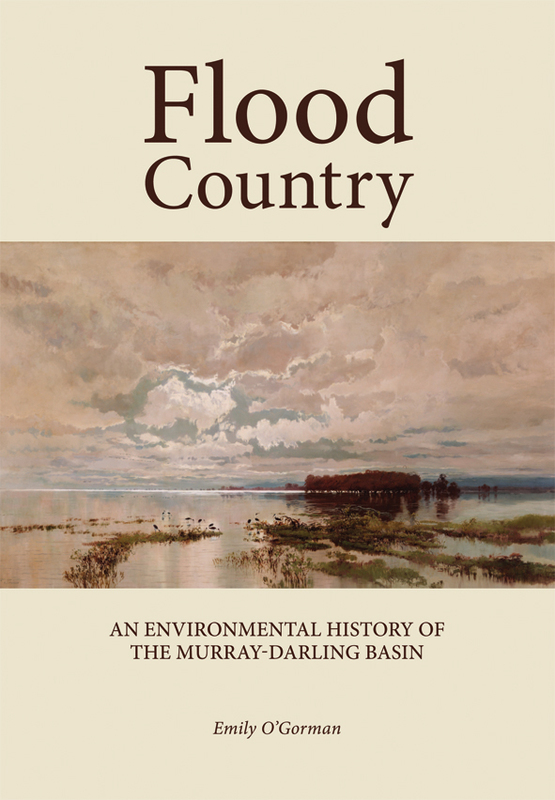 This week, Emily O’Gorman reflects on floods, as discussed in Flood Country: An Environmental History of the Murray-Darling Basin. Cover image: W.C. Piguenit, ‘The flood in the Darling, 1890’. Three weeks ago I wrote about some of the ways that flood histories have shaped contemporary approaches to and politicisations of rivers, floods, and floodplains in the Murray-Darling Basin. This week I will write about the term ‘flood country’, which I came to use as the title of my book. Some of the complex cultural meanings that have been given to floods are evident in the phrase ‘flood country’ as well as ‘flooded country’. These terms were first used by European colonists in the 1850s, and can be found quite frequently in documents relating to rivers in the Murray and Darling systems from that time onwards. Initially a simple description of flooded land, these evocative words came to describe the way the nature of the landscape had been shaped because it had been flooded. The words have especially (but not exclusively) been used by graziers as well as early colonial surveyors, and have endured in some grazing regions. 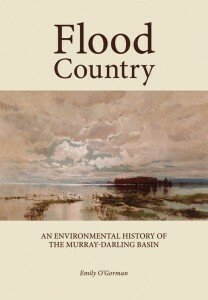 In an essay about the changing flows of the Darling River from pumping water for irrigation, historian Heather Goodall has described how pastoralists still talk about the blacksoil floodplains of the river in these terms: ‘Graziers consistently refer to the blacksoil areas of their land as ‘the flooded country’, not ‘flood-prone’ but ‘flooded’. The floodwaters are always present in the imagination of the observers, even when there has been no flow for years beyond the banks’. * Even in the harshest of droughts, the words conjured up the image of the imagined water covering the land.